The tempted housewife! The hot rock singer! The deluded dreamer! The troubled star! The groupie! The cycle freak! More music and musicians than you can shake a stick at! Get all of this and more for only $3.99! 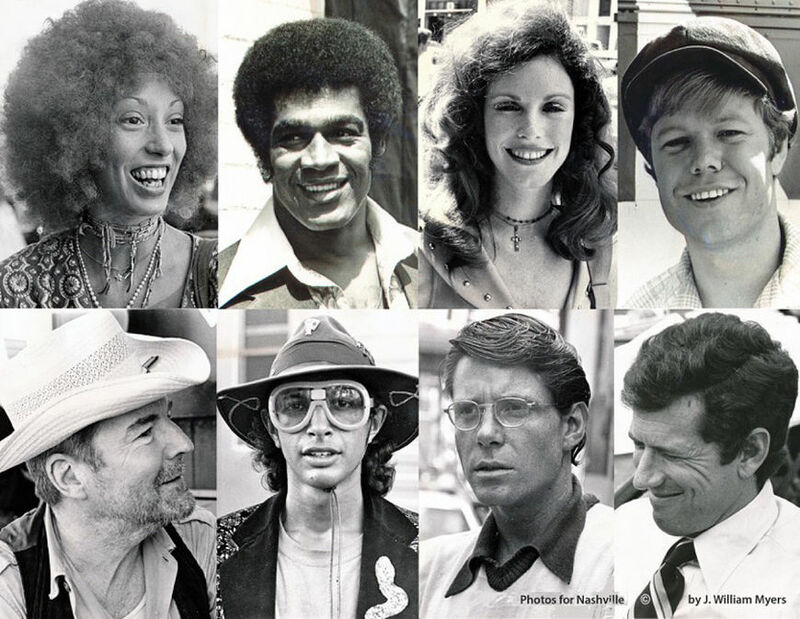 It’s fitting that Robert Altman’s 1975 classic Nashville – a musical comedy, political satire, and sprawling drama all rolled into one – should be introduced to viewers in such a boisterous, scattershot way. 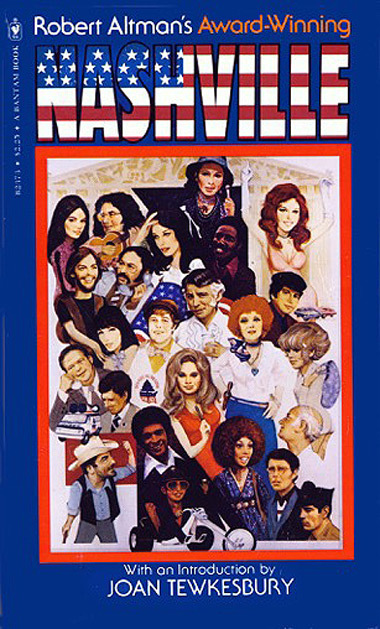 Like the film, which follows a diverse cast of characters in the five days leading up to a major political rally in Music City USA, the opening title sequence, designed by Dan Perri, is packed to the gills with recording artists and social commentary – far more than can be absorbed in just one viewing. Inspired by late night TV infomercials for cheap compilation albums, the raucous Nashville opener is a far cry from what screenwriter Joan Tewkesbury originally envisioned. 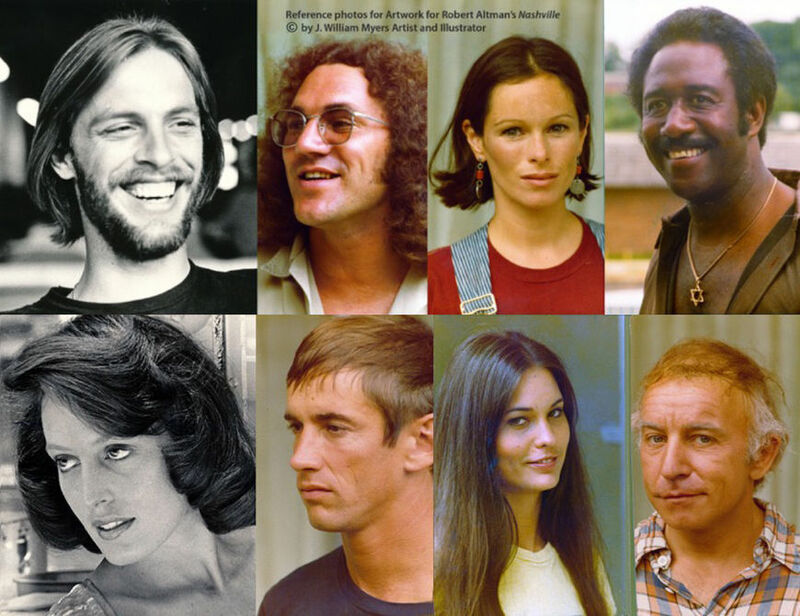 The script simply described the title sequence as a series of still photos introducing the 24 principal actors. The finished sequence accomplishes the same goal, but in true Altman fashion does so much more vociferously. The cast appears as painted caricatures of themselves, arrayed on an album cover, illustrated by J. William Myers, according to their character’s relationships to one another, each getting a brief moment in the spotlight. 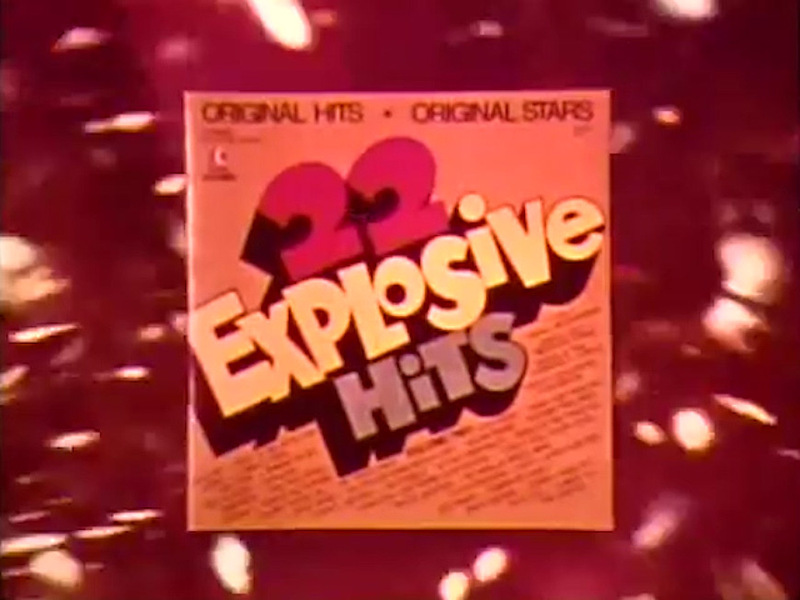 As the announcer shouts names and titles with the ferocity of an auctioneer, albums by fictional artists wheel in and out of frame, the names of the cast roll up on left and a list of songs that feature in the film (like “The Day I Looked Jesus in the Eye” and “Tapedeck in His Tractor”) roll down on the right. It’s the perfect way to introduce viewers to the star-obsessed "Country Music Capital of the World". 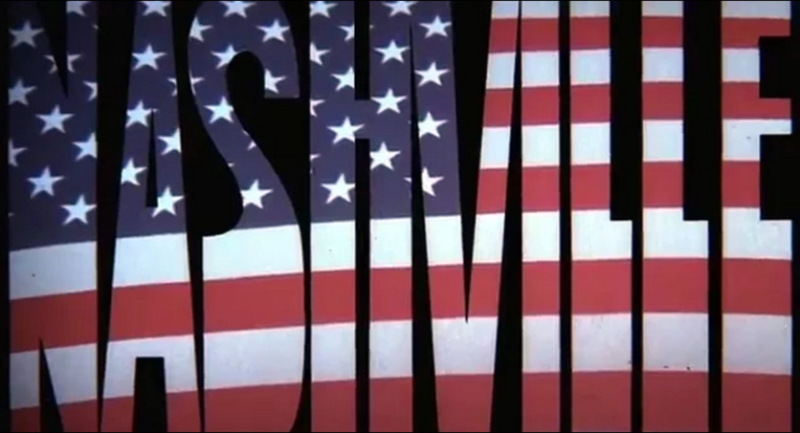 In many ways Nashville’s title sequence acts as a rebuttal of sorts to the film’s theatrical trailer – an overbearing piece of movie marketing produced by Paramount which hammered audiences over the head with character biographies and motivations. The opening at once mocks and embraces that hamfisted approach to advertising, loudly introducing the players in a thematically-appropriate way, demanding the viewer buy in. And buy in they will. 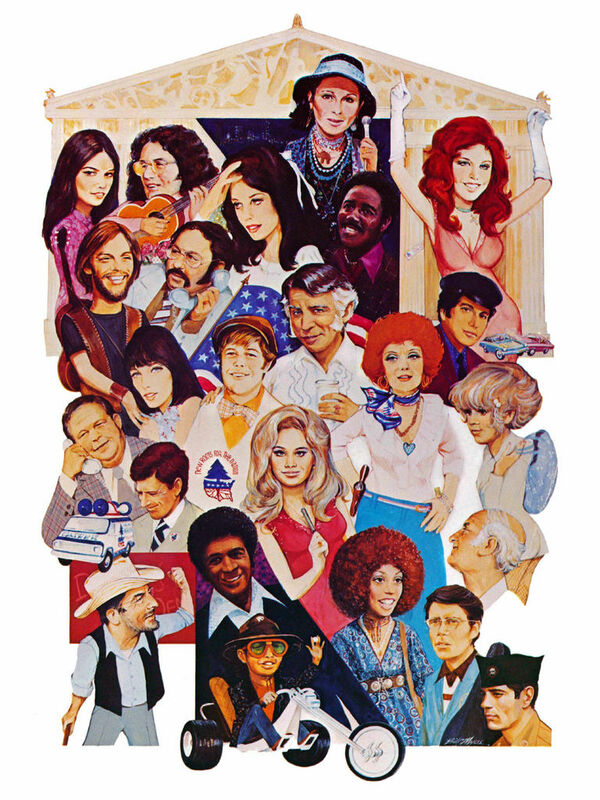 Nashville is one of Altman’s most well regarded ensemble pieces, and though it wasn’t the director’s first picture to feature a sprawling cast – that distinction belongs to M.A.S.H. 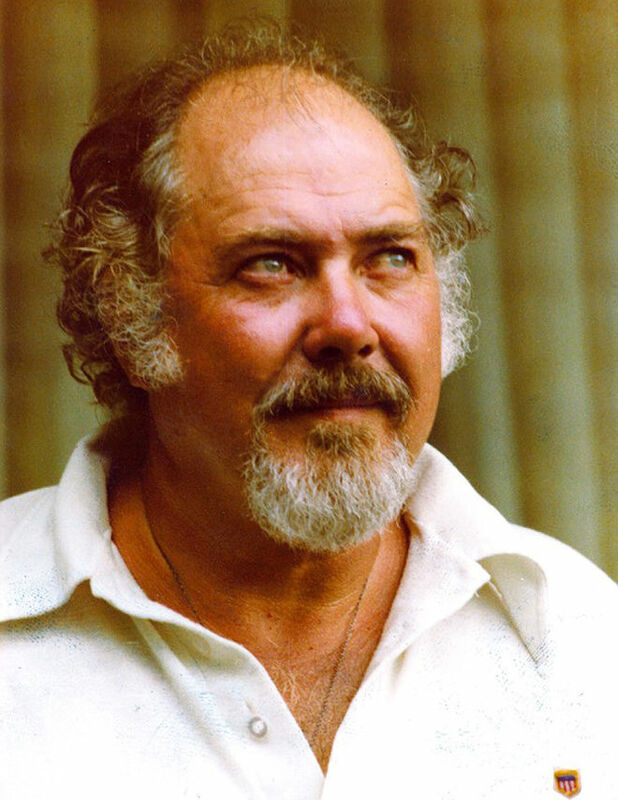 – it created the mold for future Altman efforts like The Player, Short Cuts, and A Prairie Home Companion. A discussion with Title Designer DAN PERRI and Illustrator J. WILLIAM MYERS. So Dan how did you get involved with Nashville? It’s one of Robert Altman’s most acclaimed films and has such a memorable opening! Dan: There's a story to that opening. I met Bob Altman on his previous film, the gambling film California Split (1974). Bob had called me up and said, “Hey, you know I really like your work. You were doing a picture with a friend of mine so I asked for your phone number.” So I came over and did California Split with him. He was just growing in his stature at that time. He was preparing Nashville, he’d done McCabe & Mrs. Miller (1971) and so on. He was getting financing from any studio he wanted to go to. Altman's Lion's Gate production office as it looked in the 1970s. 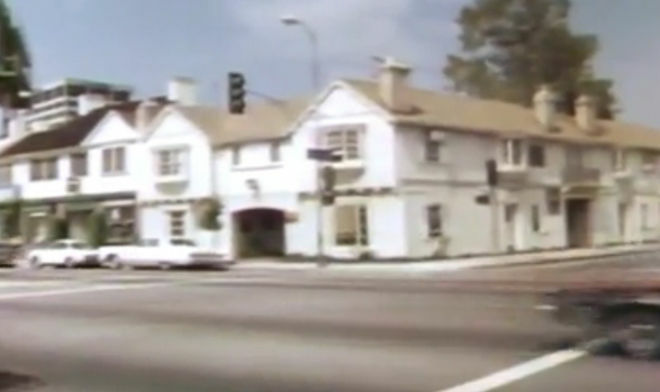 Dan: He had this wonderful one story building on the corner of Westwood Boulevard, right off Wilshire. It was this charming old building that had been built in the 1920s – it had all this architectural history to it and these lovely walkways in the middle. He gave me the front, top and bottom, of that building. It was just the best! It had a view of the street and it had a pinball machine in that front room – Bob would come down and play pinball all the time. We'd talk and play pinball. It was very exciting to be around there because there was always big name actors and producers coming through the door and meeting with Bob. He would hold court every night after hours, where he'd sit in this big kind of king-like throne of a chair with his cane and conduct conversation. Everyone would literally sit at his feet. Sit on the floor right in front of him and just absorb all of his stories. It was pretty cool. I had a wife and little kids at the time so I would go home, but I'd be walking out of there and hear “Dan, stay for a while!” “No thanks, Bob…” otherwise I’d never get out of there – and I didn't smoke dope either! So Bill how did you get involved in the project? Bill: Initially I was asked to be on the set with Harry Haun, who was writing an article for the Los Angeles Times. I was chairman of the Nashville Film Society at Vanderbilt at the time – I shepherded a lot of foreign films and independent films into there – and Harry knew my work. He was formerly the film reviewer for The Tennessean and then he went on to the New York Daily News to write film reviews and other entertainment articles. So this article was about the making of Nashville. It followed the process of shooting here, the different actors and their lives and so forth. So I was doing this drawing for the article. Harry asked me to do it in black-and-white, but I wanted to do it in colour because I wanted it to be the poster of the movie. [laughs] So you had ulterior motives? Bill: [laughs] I planned all along to have this be the poster for the movie – I never thought it would be in the titles though. So what was your original concept for the piece? Bill: I was on the set every day and I noticed that the costuming was all in reds, whites, and blues. 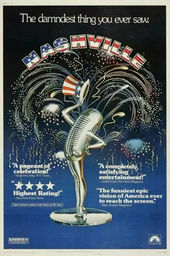 I knew immediately that this was Bob Altman’s Bicentennial movie – this was really about America not just about Nashville. It’s his paean to America. So the way I constructed this – it was 30″ x 40″, a big gouache painting – I put all the characters equal size, all 24 characters, and put them in connective relation to each other. Each head size is equal to the other and no one person dominates. But the way I laid it out, I had the trio up in the upper left hand corner, I had the manager and the singer, the politicians lower down, you see that each one is related to the next character, except for Bert Remsen who is chasing his wife all over the place. She is across the illustration. You’ll also notice that the main colours are red, white, and blue, and it really worked well. Did you spend a lot of time with the cast in order to capture their likenesses? 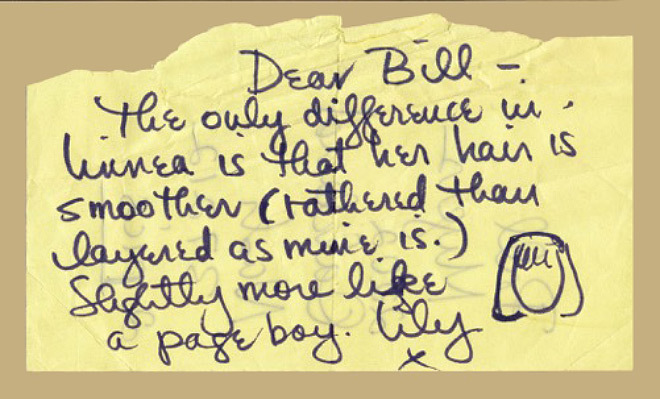 Bill: I was going to the set every day and coming home and painting it at night – to the consternation of my wife. [laughs] I actually used my own photography for a lot of these. I photographed during breaks in the action. Bill: I wasn’t there for the shooting of the domestic scenes with Lily Tomlin, but I happened to see her in the bookstore one day. I said “Miss Tomlin, I’m doing some artwork with your character in it and I wondered how you had your hair in this scene.” She took out a tablet and drew her hairstyle for me. I still have that! So I used her drawing to get the bangs. Dan, what were your first conversations with Altman about the Nashville opening? Dan: Yeah! They were exactly 60 seconds because that’s all the airtime they bought. So I wrote this diatribe, this rant based off of the record commercials, and I hired the announcer who’d done them, Johnny Grant, to do the high-powered narration from my script. We really had fun laying that down. 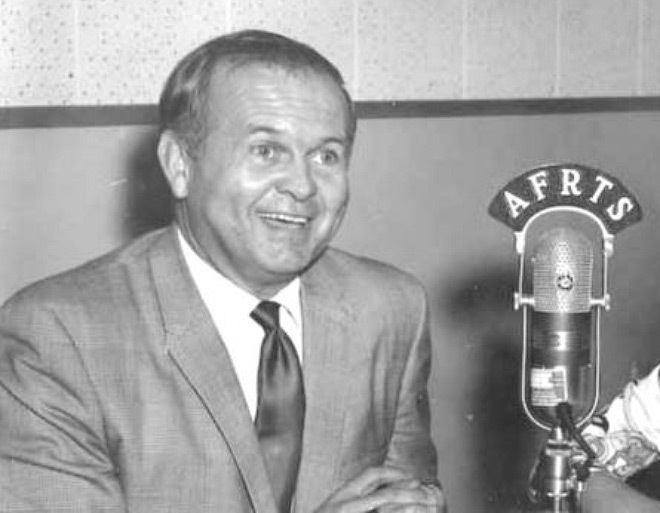 American radio personality Johnny Grant provided the voiceover used in the Nashville title sequence. What were your next steps after the recording session? Dan: Once I had the voice in place it just motivated the cacophony of images. The painting is the main ingredient of the album cover, which I move in on and move all around on. It’s all the same image and I really dove in and tried to use every square inch of it! There was a roll up and a roll down going simultaneously, images popping on the screen and sliding in. Bill, how did your painting end up in Altman’s hands anyways? That must have been nice to hear! So they bought it for $2000 and they said if they used it some place else, like in publicity for the movie, then they’d give me another $2000. That was pretty good back then! Each of the actors only got $10,000. Not bad at all! So what was your reaction to seeing your painting in the movie? Bill: My wife Bonnie and I were invited to the world premiere. It was so much fun, but somebody who had seen a sneak preview told me it about it. “Oh, your artwork is in the movie!” I thought, really? “Yeah, it’s the first thing on the screen.” [laughs] I was then able to get my other payment for the use. I had no idea that they had animated it for the titles though. Ironically, I had sent them what I thought would make a good album cover for the soundtrack. I took a full colour print of the artwork and then dummied it up to look like an album cover. If you have the soundtrack you’ll notice that they actually used that dummy instead of real artwork, which I was to complete a little later. The stars are a little closer to the red border on the left side than they are on the right. It was just meant to be used as a sample, but damned if they didn’t use it in the movie too! It comes spinning up like a late night TV ad and then they zoom in on each of the character. I wish they had used the original artwork for the animation instead of my little colour print, but it held up. It was just funny that the pseudo-album cover actually ended up becoming the real album cover. 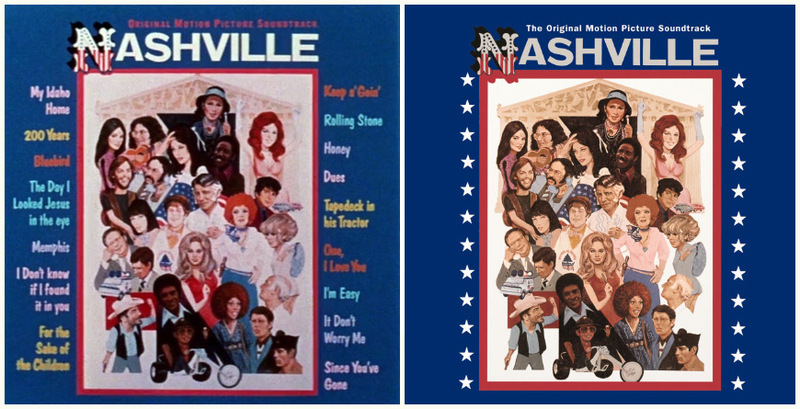 Image set: The Nashville album art as it appears in the title sequence (left) and on the soundtrack cover (right). There’s so much detail in the painting. Are there any easter eggs or details people maybe haven’t noticed? Bill: Here’s a funny thing about that: The thing to do when you’re presenting something is not to talk too much because you’re liable to say something they don’t want to hear. I said “Bob, you see all the relationships between all the characters here, but if you look at the light design there’s actually an ‘N’ for Nashville.” You can see this ‘N’ shape in the light pattern. He said “I don’t want an N.” [laughs] I said “OK!” but I didn’t do anything, I just hoped he’d forget about it. Demon’s Den, the name of a country bar on lower Broad depicted in the film, [is on the sign behind] Star (Bert Remsen). He sees Albuquerque (Barbara Harris) in there and the chase is on again. My name is actually on the guitar case in the painting, so I got a credit that way. I wish now that I’d known enough to demand a screen credit. I’m credited on the soundtrack for it though. Dan, why was the Paramount logo at the start of the film all beat up like that? Dan: So I had to go and get the logo from Paramount. Then I made a black-and-white positive of it, and then I literally rolled it on the floor off the desk. It rolled out and I kicked dirt on it, stepped on it and whatnot. Then I wound it, cinched it tight on the rewinds to grind in the dirt, and viewed it. It was all scratched up, on the the emulsion side and the cell side, and then that became the master. And how did that go over with Paramount? Dan: So we had this one clean piece of film with the whole title sequence on it and then the logo at the head of that. The day I went over to supervise the negative cutting for the whole sequence, this sweet old woman in the Negative Cutting department at MGM was given these different boxes with different rolls of the film in it. She took out the film out with gloves on and carefully and pristinely pulled it down into her bin and she looks at it and gasps, “Oh my God!” She literally rolled it up, went down the walkway to where the supervisor was – there's a whole row of negative cutters there and they're all women – and I can see her gesturing at me. The supervisor comes over slowly to explain “You can’t cut this. This is all scratched!” And I said “No, this is the way it's supposed to be! This is the way the director wants it, okay?” So it went out like that. What about the credits at the very beginning? Why do they appear twice? Dan: There are two or three titles that follow the Paramount logo, white set against black. I shot temp titles for that bit and then Bob went off to Paris with the movie. So he comes back and he says, “Hey, I showed the film to François Truffaut, and we were sitting in this little, tiny screening room. Our backs to the wall and right there was this glass that the light was coming through into this little screening room.” He said there was something about the parallax, the distance between the glass, that made it so when those first titles came on there was a little secondary shadow of the title over to the left, lower on the screen. Image set: Opening credits featuring the secondary images inspired by Robert Altman's screening with François Truffaut. That's really cool. So who else worked with you on the sequence? Dan: Bob hired [Bill] separately and I never met him. I did have an assistant with me at the time though, Noreen Beasley, who later went out on her own and started designing titles, but she never did anything creatively for me, she was just a general art assistant at the time. After I did California Split, Bob asked me to move into his building in Westwood. That's when Deborah Ross became my assistant. I hired Debbie to assist me on the paperback book and other Nashville-related pieces. Then, not long after that Debbie left to do titles on her own and later joined with Nina Saxon at Saxon/Ross. What ever happened to that original painting? Do you still have it, Bill? You still live in Nashville, right? What was the initial reaction to the film there? Bill: There was a big controversy over whether the local musicians would like it or not – a lot of them didn’t like it, they thought it was too satirical of their lifestyle. But some of the actual record producers and publishers were laughing their heads off because they thought it was really funny. So you had this conflict between the performers and the big shots. The big shots thought it was really great! 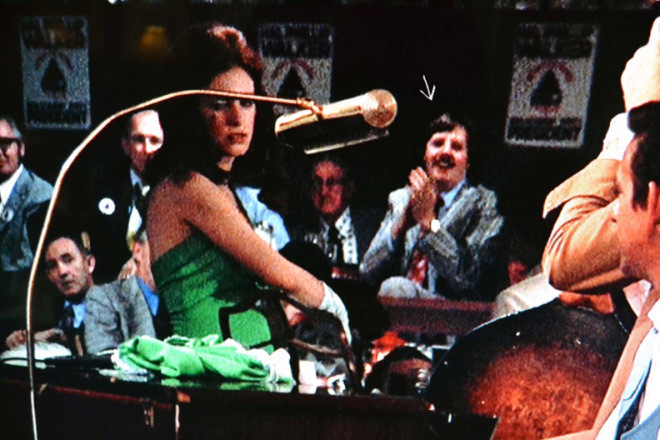 J. William Myers in the background of a scene from Nashville.